Andrew Gaze made his way to the Hunter Valley in search of adventure, with his camera crew at the ready and packed with No Fear Andrew took a Flight in Australia’s Fastest Ride. 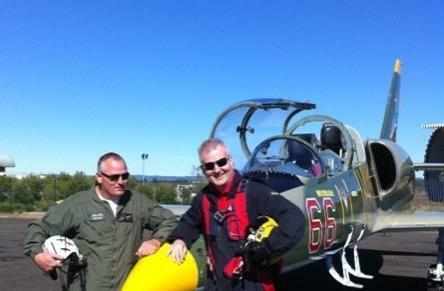 Jet Flight Australia operate the L39 Albatros Jet Fighter based at Cessnock in the Hunter Valley. Gaze retired from international competition, but continued to play in the NBL. On 12 May 2005, he announced his retirement from the game after 612 games in the NBL and 20 years of professional basketball. Soon after, he released his autobiography, A Kid, a Ball, a Dream, co-authored with Grantley Bernard. Today, Gaze has carved out a career as a media personality, appearing on commercials for and commentating NBL basketball matches for Fox Sports. Also, Gaze appeared in series five of Dancing with the Stars. Andrew currently is a presenter on Channel Seven’s Guide to the Good Life. and he certainly is playing the correct roll flying in Australia’s fastest ride. The 5 time Olympian had more butterfly in his stomach in preparation for the Jet flight than any Olympic game he had played in. Andrew soon settled in for a ride of a life time taking the jet head on zooming vertical ,looping and rolling around the skies of the Hunter Valley.